Give the gift of a craft beer adventure! Available in any denomination, and also conveniently priced for our most popular Vancouver Brewery Tour, brewery tour gift certificates make the perfect experience gift for friends, family, co-workers, and even that hard to please beer nerd friend you have. 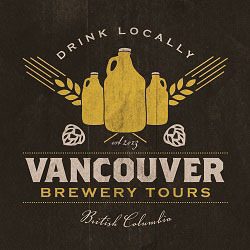 Purchase a Vancouver Brewery Tours Gift Certificate here! Please note VBT is not responsible for incorrect information added to the printable gift certificate by the purchaser or recipient. In the event that the legitimacy of information contained on a guest printed gift certificate comes into question, the original email sent by VBT containing expiry date and coupon code will be considered true and legitimate. The above gift certificates can also be used towards the purchase of any VBT product, including private tours.